I never get around to taking pics of my dolls for things like Halloween, Christmas and Easter - I don't seem to have seasonal outfits or the right props. So as I sat at my PC, munching my way through a hefty Toblerone, I was so happy to see the work of Tillietogs over on Flickr. Lots of little dungarees and leotards! It's lovely to see them all together and Trish has been really busy. 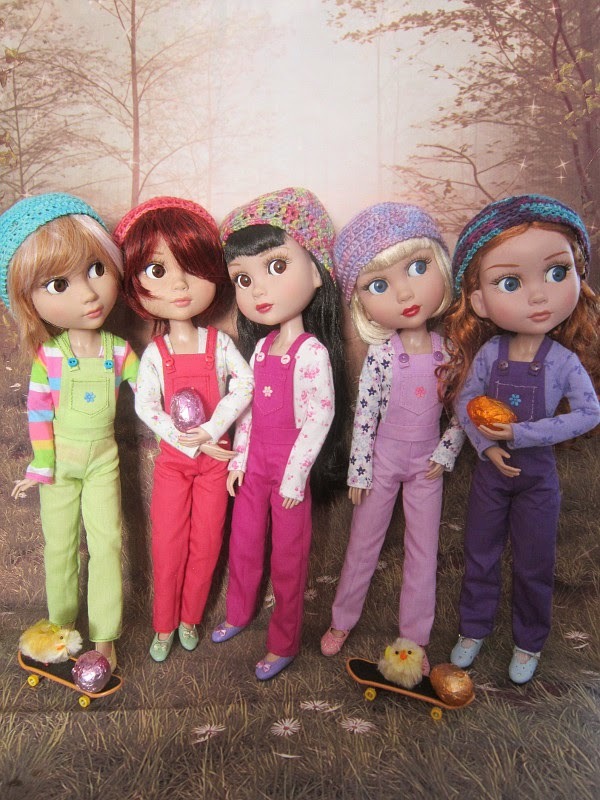 Here's her picture of her lovely collection of Patience dolls in the SSP-007 Patience dungarees pattern. Full credit goes to Trish for all this work, the photo... and all that dedication. I love that she's added her own special touch with those lovely little crochet hats. Well if it wasn't for your lovely patterns they wouldn't have all these lovely outfits to wear! I'm all dungaree'd out now so time for something for the lovely Ellowyne and back to the Liberty fabric - the plain cotton was a bit tough on my fingers lol!!! Happy Easter - ah Toblerone - sounds very nice! Ooh yes, poor sore fingers! I was wondering where you got those cute little coloured shoes? I only noticed them while I was typing the blog entry! I'm so unobservant. Gigi is wearing Bel's orginal shoes and the rest of them have shoes from JuJus dolly mall on ebay. The yellow, green and purple pairs were for Marley - they are a tad tight on Patience but JuJu does sell the same shoe now to fit the flat footed Ellowyne or Patience - they are a tiny bit large but at least you can wear them with tights! She is - when she sent the wrong shoes - she resent them and let me keep the ones she'd sent in error - that's how I know that the Ellowyne/Patience shoes are slightly big on Patience!! She did have a set of 4 pairs of boots that I might get for them! And a side order of frills. Developing the princess line dress. Drafting a princess line dress.